Secretary of Labor and Workforce Development Rosalin Acosta (center left) and Lt. Gov. Karyn Polito (center right) talk with the young men who recently completed a YouthWorks training program in Fall River. Young men who recently completed a YouthWorks program in Fall River, learning both technical skills and soft skills to prepare them for the workforce, had the opportunity to discuss their experiences in the program with Lt. Gov. Karyn Polito and Secretary of Labor and Workforce Development Rosalin Acosta on Thursday, March 21. The twelve program participants, unemployed and low-income men ages 18-21, had 100 percent attendance in the training component of the program and were finishing internships at Whirlpool Corporation’s Fall River manufacturing plant, the largest plant in the world dedicated to commercial laundry. They all passed the OSHA 10 certification, too. 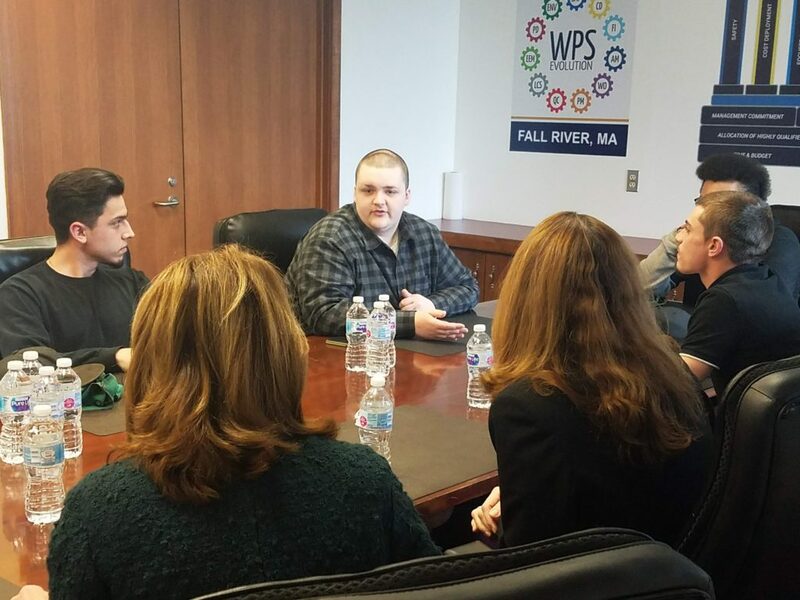 Before the lieutenant governor and secretary had a private conversation with the program participants, Polito told them that their involvement and honest feedback will help Massachusetts expand the program. “Your participation helps us perfect it, make it better, and make it more available,” she said. YouthWorks program participant Kyle Manchester (center) speaks to Lt. Gov. Karyn Polito and Secretary of Labor and Workforce Development Rosalin Acosta about his experience and thoughts about the YouthWorks training program. Polito mentioned that since 2015, the Workforce Skills Cabinet has invested more than $50 million in training equipment and educational infrastructure through the Skills Capital Grant Program. That equipment has landed in classrooms and technical schools like Diman Regional Vocational Technical High School, which ran the three-month welding training after school hours for the program participants and coupled that training with the Signal Success soft skills curriculum developed by Commonwealth Corporation. Acosta said the expansion of Youth Works from a strictly summer job program to a year-long program, with opportunities such as the Fall River program, are critical to addressing the skills gap and helping employers fill jobs with trained and capable employees. She also stressed the importance of the soft skills taught through the Signal Success curriculum. The MassHire Bristol Workforce Board served as the lead agency in developing and running the program. Tom Perreira, executive director at the MassHire Bristol Workforce Board, said that in developing the program focused on delivering the skills that employers were looking for, and said the program’s success was only possible through the partnership with Commonwealth Corporation, the Executive Office of Labor and Workforce Development, Diman High School, the Bristol Workforce Board staff and the MassHire Fall River Career Center.